When it comes to running a smooth, successful classroom, good procedures are key. And it’s amazing how even just one new procedure can eliminate a myriad of problems and save you about 500 premature gray hairs. Last year I shared 10 Procedures that Will Save Your Sanity & the post was so well received that I decided to share 10 more. Some of these procedures were life-savers for me. And others I’ve come across recently & sure wish I knew about years ago. I hope you’ll find one to save some of your sanity & make your classroom run just a bit more smoothly. Create a running list of missing work in Word on Google Docs. Trying to track what work is missing & then reminding kids about it can be a nightmare. But keeping a running list on your computer makes it so much easier. Have a document for each class and simply record the students’ names and missing assignments, putting a new name & assignment on each line. For students who were absent, write the appropriate due date next to the assignment. When something is turned in, delete that line. And when you want to inform students of what they’re missing, simply print out as many copies as you need to & give a copy to all the students with missing work. Have your students use cover sheets during tests. When a student is struggling on a test and a classmate’s answers are sitting 12 inches away, the temptation to cheat can sometimes be too much. Remove this temptation by requiring your students to cover their answers with a blank sheet of paper. Use bellwork. When you consistently have a start-of-class activity (also called bellwork), not only do you maximize every minute and get your students focused right away, but you also provide time for yourself to take attendance, talk to students, and prepare to teach. I explain this strategy in detail here. And if you happen to teach middle school math, I offer a free set of math bellringers here. Teach students to sit down & get started as soon as they enter your room. Instead of allowing students to wander around and socialize before class starts, teach them to go right to their desks, get their materials ready, and get started on the bellwork. This keeps your class more focused & on-task and eliminates all kinds of problems. Require students to grade in a different instrument. Whether students are grading their own or someone else’s papers, make sure they are grading in something very different than what the work was done in. For example, if they took a quiz in pencil, they should grade in pen. This keeps students from being tempted to change answers, and it also keeps you from getting confused about what was there originally and what was added during grading. Have students post & present problems in class. To go over math or grammar homework, have students put the problems on the board and present them to the class. Not only is this a more efficient use of time than your working them all out yourself, but it also deepens students’ understanding and improves their communication skills. Click here to read more about how to implement this strategy. Use the phrase “ask me after class.” When students ask off-topic questions that you don’t have time to answer, make it your policy to simply say, “Great question. Ask me after class.” This response keeps class on-track without squashing kids’ curiosity. If they care enough to ask you later, then you take the time to answer them, but often they forget or were simply trying to get you on a rabbit trail. Use “I need help” cards. I just ran across this idea when Emily D. shared it in our Create Your Dream Classroom book club & I’m kind of in love. Here’s how it works: Create a laminated index card for each student with one side saying “I need help” and the other side saying “Working.” When they need help, they flip their card and find another problem that they can do. This eliminates the hand raising and time-wasting while they wait for you to get to them. Genius! p.s. You know there’s more to procedures than just thinking them up and telling your students, right? You’ve got to actually teach them to your students, and that involves a very specific process. Check out this article for details about how to teach procedures to your students. And if you haven’t seen the original list (which includes a an ingenious way to solve that annoying pencil problem), click here to discover the original 10 procedures that will save your sanity. 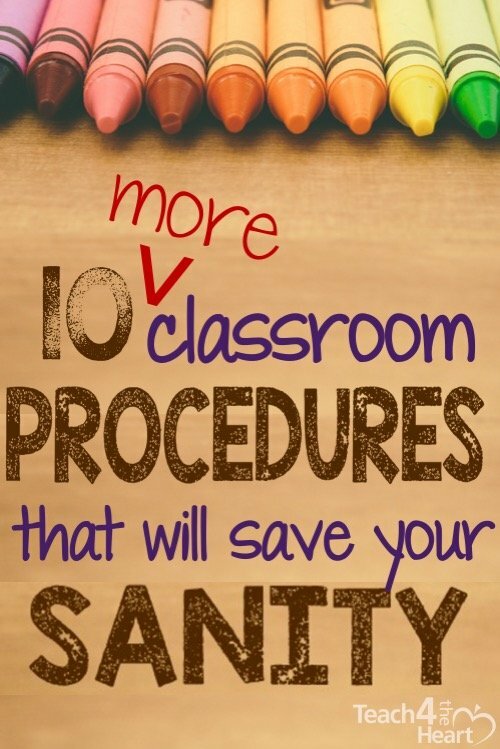 What other procedures help your classroom run smoothly? Share them with a comment below.